grand opening giveaway - CLOSED! The NoOb picked out this bracelet just for you, I hope you like it! ***Be sure to leave an email address so I can contact the winner. ***Please make sure you leave a comment for each entry; each person has a maximum of 6 chances to win. Contest ends 3/20/10 The winner will be selected randomly and announced on Sunday, March 21st. My favorite piece of jewelry featured in your shop is the Cantaloupe Today Brass Flower Garden Spring Necklace. I tweeted about your giveaway too! and last but definitely not least, I became a fan on FB! I really like the four leaf clover Just My Luck necklace.... pretty! I like the Say Violet necklace, very pretty. Thanks for the giveaway. Say Violet Purple Flower and Crystal Briolette Brass Necklace is beautiful!! But I'd love to see more jewelry with roses in them. i follow this blog through google connect! I love the Cantaloupe Today Brass Flower Garden Spring Necklace! I love Picasso was Here Glass and Brass necklace: http://www.etsy.com/view_listing.php?listing_id=42281446. Cute store! Thank you for the chance to win the beautiful bracelet! The Sparrow's Compass Brass Necklace is my favorite! But honestly, all of your jewelry is gorgeous! i love how industrial the chain and metal is on the necklaces but then the pendant is so romantic. it's such an interesting combination and really works well! I love Whimsy Spring Brass Flower Garden Bracelet...the colors are beautiful. I'd love to see more bracelets in your shop! LOVE your Whimsy Spring Brass Flower Garden Bracelet! The colors are so Spring-like!! I love the sparrow compass necklace, and I would love to see more necklaces in your shop! I love vintage clothes and jewelry!! You have a nice variety of colors, while staying true to your style. Beautiful shop! I like the Picasso Was Here Glass and Brass Necklace. I like the simple design of it. I love the shades of color and the rose cabochon goes so well with the quartz glass briolette! Stunning work. I am following your twitter as PSVintage! I became your fan on facebook! I love the sparrow's compass necklace. It's absolutely darling. 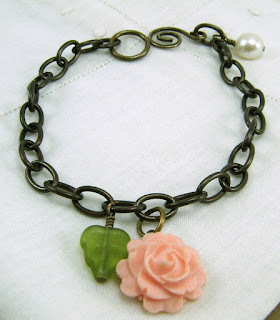 I really really like the Whimsy Spring Brass Flower Garden Bracelet! I absoluetly L-O-V-E My Florida Sea Foam charm bracelet! Super cute giveaway. I'm a sucker for jewelry, especially the handmade type. BTW, I have a giveaway going on at my blog too. Come on over and check 'er out! I can't decide if I like Ivory Irish Rose Brass and Glass Necklace or Sparrow's Compass Brass Necklace best (it's all so pretty!). I'm also a Facebook fan. Love the Topaz Crystal Bronze and Brass Wire Wrap Bracelet.